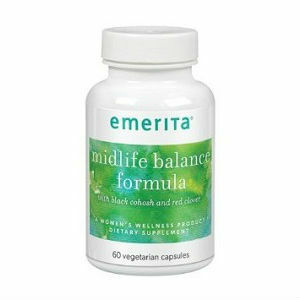 Midlife Balance Formula is an herbal supplement for women containing Black Cohosh, Red Clover, Dandelion and Chaste Tree Berry. 500 mg Red Clover Extract (Trifolium Protense) (standardized 8% isoflavonoids) (aerial extract). 100 mg Alfalfa (Medicago sativa) (leaf). 80 mg Black Cohosh Extract (Actaea racemosa) (standardized 2.5% triterpene glycosides) (root extract). Other Ingredients: Microcrystalline Cellulose, Magnesium Stearate, Silicon Dioxide, Vegetarian Capsule (cellulose) no content amount in milligrams is provided for other ingredients. $25.09 for a 60 capsule container (1 month supply). The product can be bought on line or through a dealer network. The product site does contain a contact phone number but otherwise the vendor does not provide any product guarantee or return policy. The vendor does provide an email tool to use to send questions or comments to the vendor and also provides phone contact number. While the product is moderately priced in view of the lack of information about product guarantees or returns (the product source specifically states that the product is purchased as is) any prospective purchaser may want to have a health service professional review this product prior to purchase. Jackie Horowitz	reviewed Emerita Midlife Balance Formula	on February 22nd	 and gave it a rating of 2.